Find out what it’s really like to be volunteering with elephants in South Africa from Oyster volunteer Andrew. Andrew volunteered for 6 weeks in June and July 2012 and here is what he has to say about it. Thanks Andrew! “Where to begin? The 6 weeks that I spent at the elephant park in South Afica were the best 6 weeks of my life by far. From walking out with the elephants in the first morning I arrived there, I knew straight away that I wouldn’t want to leave! We timed it just right so that when I actually arrived at the park, I was able to see the elephants walking into the boma where they’d spend the night. During your nights at the park, you can spend your time either with the other volunteers in the lounge or kitchen area, maybe in your bedroom if you would rather be by yourself, or you can watch the elephants settling down on the viewing platform where the guest lodges are. Here you sit on the very comfy chairs, blankets wrapped around you on those cold nights, watching the elephants peacefully eating, interacting with each other or sleeping. A typical day at the park will be spent in and out of the field and some of it doing general work. When out in the field you’ll be collecting important research data for various studies into elephants. Be prepared to be collecting dung samples in the morning! There’s nothing like the fresh smell of elephant dung first thing in the morning I’ll tell you now. During the mornings, if you aren’t doing research, then you’ll be needed in the boma. After the elephants walk out at 7am, the boma needs clearing of all the branches and dung so the elephants have somewhere clean to sleep to following night, some of the volunteers used to call this their daily workout! You would be doing this for 45 – 90 minutes, depending if you are on the first shift or not, and then going to have breakfast. Other tasks that may need to be carried out during the day will include collecting hay for the elephants, maybe a bit of weeding at the garden where fruit is grown or painting the tyres! There’s also data to be entered or you may be asked to make enrichments for the elephants which is a nice break! On the weekends, from around 12:30pm on the Friday until the Sunday, you are free to do practically anything! You’ll go shopping at around 2pm for your weekly food shop on the friday, taken by minibus and returning just after 4pm. A few things that I managed to do while I was out there included, Bungee jumping off of Bloukrans Bridge, sky diving, whale watching, visiting different animal parks and animal sanctuaries. We also spent an unplanned weekend in Mossel Bay which was quite the experience. If you get the opportunity to do any of these activities I strongly recommend them! While doing the bungee and the skydive, you get the best feeling ever while in the free fall, I will say I was scared at first when I jumped out of the plane and off the bridge but something just clicks and its the most insane feeling you’ll ever get. When we went whale watching we were lucky enough to see 2 southern right whale just off the shore line, it was spectacular! We also went to a seal colony where they were swimming right up to the boat, there must have been nearly a thousand seals there. As well as these we managed to go to MonkeyLand and Birds of Eden, a wild cat sanctuary where I did a sunrise walk with a Cheetah, canopy zip-lining tours, caving and a safari. 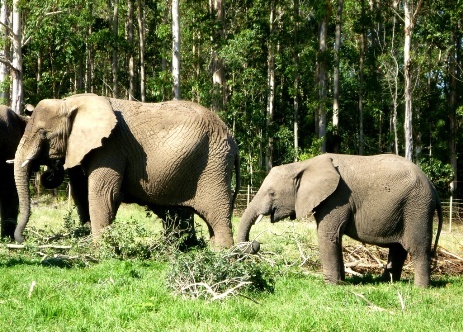 We also managed to go to another elephant park called Elephants Of Eden near Port Elizabeth for 4 days doing research on 6 of the elephants there. This park is situated in a valley surrounded by trees, an elephant’s paradise in my opinion. They could roam freely from the morning until night fall when they would return to the boma to stay overnight. It is also home to the largest sand dunes in the world and seen from space. A beautiful setting along with zebra roaming in the park! Trying to I.D these zebra was hard work but very fun. The 18th of July I will always remember. We were able to take part in Nelson Mandela day, which is a day where you help the less fortunate for a minute equal to every year that Mandela was in service to South Africa, 67 years = 67 minutes of helping those in need. I was incredibly happy to be find out that we would be helping out a children’s shelter, called Masizami Children’s shelter. This was by far one of the most memorable days, seeing the biggest smiles on the children, was incredible. We built them a garden so they could play somewhere they would enjoy being, instead of just a back yard. Towards the end, one of the children gave a speech saying thank you in Afrikaan, then they sung for us which was amazing! I would thoroughly recommend this to anyone who loves animals or traveling. Being able to get up close to these elephants in particular is incredible. This has been one of the best decisions I have ever made and I’m very glad I did it. I met 23 amazing people out there who I hope to keep in contact with from all over the world, I met 15 special elephants, a group of amazing staff at the park who make it run so well from the guides, the research team and the staff in the restaurant. Previous Post Where do the rescued elephants in Thailand come from?